In November 1944, the U.S. Navy fleet lay at anchor in Ulithi Harbor, deep in the Pacific Ocean, when the oiler USS Mississinewa erupted in a ball of flames. Japan's secret weapon, the Kaiten-a manned suicide submarine-had succeeded in its first mission. The Kaiten was so secret that even Japanese naval commanders didn't know of its existence. And the Americans kept it secret as well. Embarrassed by the shocking surprise attack, the U.S. Navy refused to salvage or inspect the sunken Mighty Miss. Only decades later would the survivors understand what really happened at Ulithi, when a diving team located the wreck in 2001. 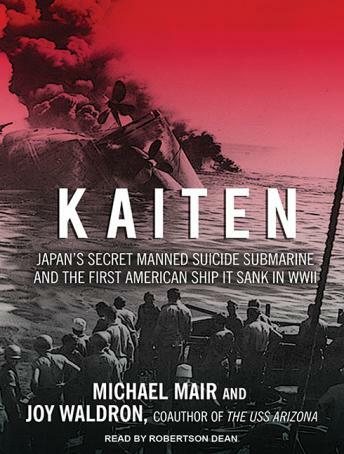 In Kaiten, Michael Mair and Joy Waldron tell the full story from both sides, from the strategic importance of the USS Mississinewa to newly revealed secrets of the Kaiten development and training schools. U.S. Navy survivors recount their gripping experiences in the wake of the attack, as well as the harrowing recovery efforts that came later. Japanese pilots reveal their terrifying experiences training to die for their country and Emperor, never knowing when their moment of doom would come.